Total area: 30,814 sq. kms. Hyderabad was first made a Vicariate in 1851 and Msgr. Daniel Murphy was appointed the first Vicar Apostolic. 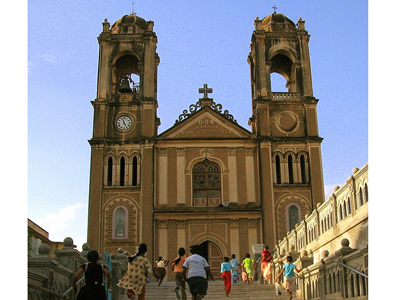 The diocese of Hyderabad was established on September 1, 1886. Msgr. Peter Caprotti, PIME, became the first Bishop of Hyderabad. It was raised to the status of an Archdiocese on September 19, 1953. Bishop Mark Gopu became the first Archbishop. Over the years many new dioceses were created from the original territory of the Archdiocese. In 1928 districts of Raichur and Gulbarga were detached to form the diocese of Bellary. Krishna and West Godavari districts were detached in 1937 for the erection of the diocese of Vijayawada. Diocese of Warangal was established in 1952 with the districts of Warangal, Khammam, Nalgonda and Karimnagar. In 1976 the new diocese of Nalgonda was formed with Mahabubnagar district of Hyderabad Archdiocese and Nalgonda district of Warangal diocese. Marathi speaking areas of the Archdiocese were detached in 1978 to form the diocese of Aurangabad. Khammam was made a new diocese in February, 1988. On June 18, 1982 the district of Bidar was entrusted to the pastoral care of Mangalore diocese. The Archdiocese with an area of 30,814 sq. kms. and with a total population of around 12.37 million, has about 87,541 Catholics. It has 107 diocesan and 116 Religious priests, 37 Brothers and 729 Religious Sisters are active in 72 parishes, including one parish of Malankara rite. At present the Archdiocese has four districts of Andhra Pradesh - Hyderabad, Ranga Reddy, Medak and Nizamabad.